Arnold George ("Arnie") Weinmeister was the son of John George ("John") and Susanna Weinmeister. In 1899, John Weinmeister immigrated to Canada with his parents from the Volga German colony of Dietel, Russia. In 1907, John married Susanna Werner who was also born in Dietel, Russia. Arnie Weinmeister was born on March 23, 1923 in Rhein, Saskatchewan, Canada. His family later moved to Portland, Oregon where he attended Jefferson High School and was a two-time All-City tackle. Weinmeister played end, fullback, and tackle during a 4-year tenure at the University of Washington which was interrupted by four years army service. 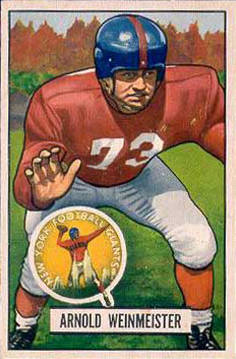 Weinmeister turned professional in 1948 and played defensive tackle for the New York Yankees in the All-America Football Conference until 1949, and for the New York Giants from 1950 to 1953. In his final season with the Giants, he served as team captain. Weinmeister played two final years (1954-1955) of professional football with the British Columbia Lions. "Few players ever have been so dominant at their position in pro football than Arnie Weinmeister." Weinmeister is also listed as one of The 50 Greatest Oregon Sports Figures by Sports Illustrated magazine. 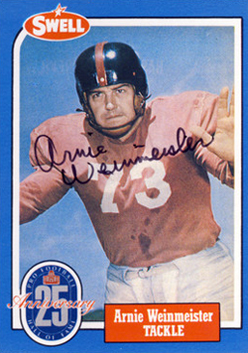 Arnie Weinmeister died on June 28, 2000 in Seattle, Washington.